* The parts of the cities are based on their real-life counterparts, such as Liberty City's neighborhoods. There are neighborhoods like [[Brix]], which is based on The Bronx, [[Brocklyn]] (obviously based on Brooklyn). Vice City has districts such as [[Vice Beach]] and [[Banana Grove]], which are based on Miami Beach and Coconut Grove. Page looks messy. Image placement, bullet placement and red link removal could help. Grand Theft Auto is set in Liberty City, San Andreas and Vice City in 1997. These renditions of the cities are vastly different from their more well-known counterparts in the GTA III era. In the game, the player can choose from one of about eight protagonists, and even change their names. It begins with only one level to choose from. The player works for Bubby. They have the player do several jobs, ranging from stealing two taxis to killing the police chief. One mission also involves a trap in the form of a bomb on a bus that will blow up if it gets below 50 mph (this was inspired by the movie Speed). Once the player has enough points, A mafioso will want to speak to them. Apparently the player double-crossed Bald Man Sonetti, and is a dead man if it happens again. Law enforcement in GTA 1 is generally characterized as a obstacle in the game, appearing in the force of police officers who are ready to pursue arrest the player if they player has committed sufficient criminal acts. The player's wanted level is defined by the number of police heads seen on top of the screen; the more police heads the player amasses by commuting more crime, the more determined the police will be to subdue the player. The player can have up to four police heads, which at this point leads to very hostile officers. The game, with its violent subject matter, generated a great deal of controversy. However, this was deemed to be intentional, and was the first game known to have been publicised in such a way. 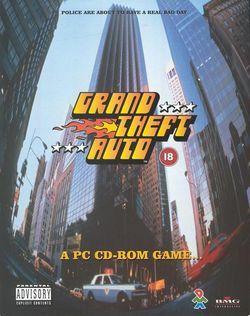 Take-Two Interactive, the publishers of Grand Theft Auto, hired publicist Max Clifford to generate an aura of controversy about the game in the local media. As a result, politicians stepped into the fray. Whatever the impact on game censorship and the perception of video gaming, the publicity worked - the title was hugely successful simply because those attempting to ban the game were inadvertently generating publicity for it. This has been a known and recognised phenomenon of violent video games ever since.